American Icons - Mustangs, Etc. Many people first imagine a pickup when thinking about what someone would drive here in the US. Ford is the reason for that. Introduced in 1948, the Ford's F Series began as the Ford Bonus-Built Trucks with the F-1 1/2 ton, F-2 3/4 ton, and the F-3 Heavy Duty followed by five more models, all being classified by weight and lending to separate purposes. These were Ford's first vehicles post-World War 2. The idea was to replace the car-based pickups with a truck that used a dedicated frame design. From 1946-1968 some of the F Series trucks were also marketed as Mercury M Series in other markets. In 1953 there was a complete redesign. New options, more efficient engines, bigger space, and a better frame. Previously, 4 wheel drive was outsourced to another company but in 1959 Ford became the first of the Big Three (GM, Ford, and Chrysler) to manufacture their 4wd trucks by itself. The F1 became the F-100, named after the F-100 Super Sabre jet. The redesign in 1961 introduced a unibody "integrated pickup" design. However, this move was met with bad reception following complaints about the doors jamming up when the truck was carrying a heavy load. This layout lasted only until a 1965 mid-cycle redesign with a completely new platform. The Twin-I-Beam front suspension designed then would be used until '96 on the F-150 and until 2016 on some other models. 1973 brought more modernization to the F Series including disc brakes, improved air conditioning, and increased cabin size. 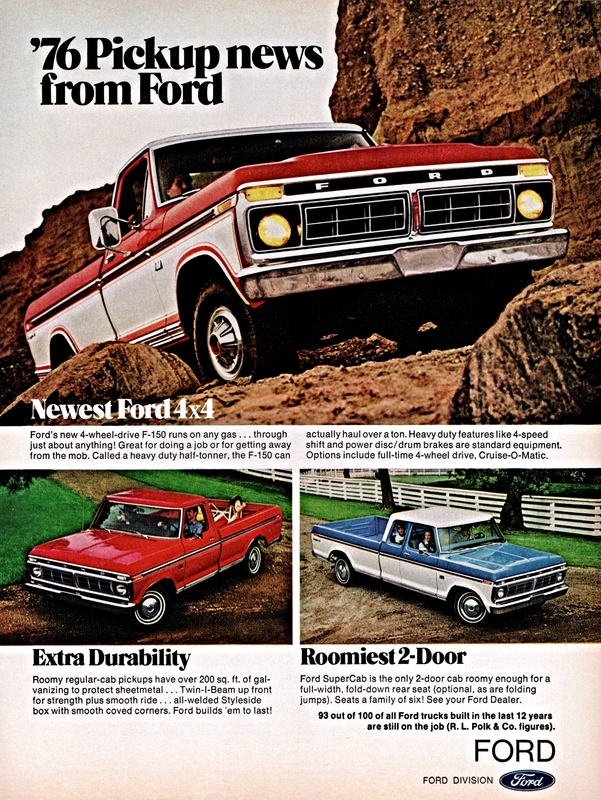 Around this time, the Ford Bronco also became a variant of the F Series pickup. In 1980 the line got a total ground-up redesign. Better aerodynamics and fuel economy became a focal point for Ford. Holes were placed throughout the frame in order to lessen weight. 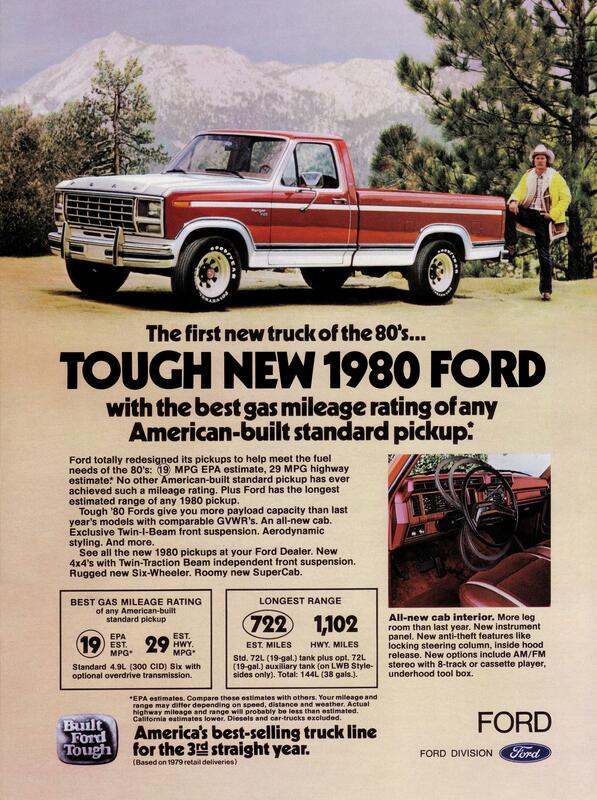 This is also the first generation of trucks to offer power windows, locks, and mirrors. Slight platform alterations, improved fuel economy, and many modernizations continue to be included in the F Series vehicles but all the same spirit and stylishness remain. Excitement has really stirred for the 2017 Ford F-150 Raptor, which will be the first vehicle on the market with a 10 speed transmission, something which happens to be designed by collaborating rivals GM and Ford. The power of this new model is not something to underestimate. The F Series and the popularity of trucks that can get a job done show off Ford and America's legacy of hard work and hardworking vehicles.